Within this decade we will likely witness not only the world’s first kilometer-tall building, but also the completion of a significant number of buildings over 600 meters (around 2,000 feet) – that’s twice the height of the Eiffel Tower. Two years ago, prior to the completion of the Burj Khalifa, this building type did not exist. And yet, by 2020, we can expect at least eight such buildings to exist internationally. The term “supertall” (which refers to a building over 300 meters) is thus no longer adequate to describe these buildings: we are entering the era of the “megatall.” This term is now officially being used by the Council to describe buildings over 600 meters in height, or double the height of a supertall (see Figure 1). As we started the 21st century, just 11 short years ago, the Petronas Towers held the title of “The World’s Tallest” at 452 meters (1,483 feet) in height. Taipei 101 took the title in 2004, at 508 meters (1,667 feet).Then, at the end of the decade, the Burj Khalifa set new standards at 828 meters (2,717 feet) – over half a mile high. Now, with work set to start on-site in January 2012 for Jeddah’s 1,000+ meter Kingdom Tower (see Figure 2), we can expect that in a mere two decades (2000–2020) the height of the “World’s Tallest Building” will have more than doubled. What is perhaps the most interesting aspect of the study is that the previous world’s tallest mentioned above now barely make the list at all. In just two decades Petronas will have gone from 1st to 27th tallest in the world, and Taipei 101 just scrapes into the study in 18th place. When we take into account that new projects not included in this study will surely be announced and built throughout the next decade, one can predict that, with the exception of the Burj Khalifa and Makkah Royal Clock Tower, all of the tallest 20 buildings in the year 2020 are not yet built (though a number are already under construction, see Figure 3). The tremendous change that the tall building industry has seen in two decades is clearly shown by a juxtaposition of three skylines: the tallest 20 buildings in the year 2000, 2010, and 2020 (see Figure 6). It is also useful to understand the tallest 20 in 2020 in the context of global tall building trends. The average height of these twenty buildings is predicted to be 598 meters (1,962 feet). Yet, as we stand at the end of 2011, there are actually only 61 buildings currently in existence over 300 meters (the threshold for “supertall”). Until recently, in fact, the completion of a supertall was rather a rare occurrence, with only 15 supertalls completing in the 65 years between the world’s first such building (New York’s Chrysler Building, 1930) and 1995. It was only in the mid 1990s that it became common for more than one supertall to be added to the lists annually, with 1995 being the last year when no supertalls were completed. Now, less than two decades later, the number of supertalls completed annually has entered double digits, and is set to continue to rise. 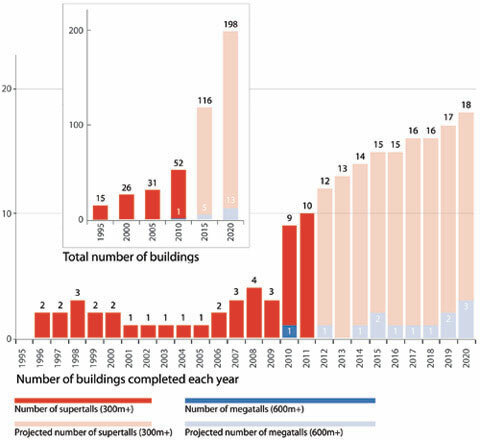 Meanwhile, the number of megatalls set to complete in the upcoming decade is similar to the number of supertalls completed in the 90s (see Figure 7). 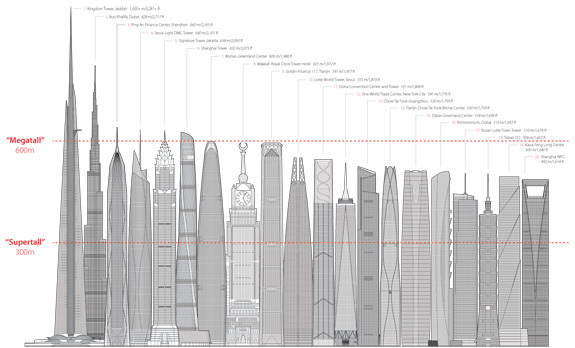 In terms of height, therefore, 600 m seems to be the new 300 m.
Note: CTBUH can accurately predict the number of supertall completion through 2013. The figures for following years are estimates based on current building trends and construction activity. With over 1.3 billion citizens and a rapidly urbanizing population, China is perhaps the country with the most obvious reason for building tall. The ten Chinese projects show great diversity in location, spread across seven cities: Shenzhen (2), Shanghai (2), Tianjin (2), Wuhan (1), Guangzhou (1), Dalian (1), and Taipei2 (1). The tallest of these, Shenzhen’s Ping An Finance Center (see Figure 8), is now under construction and scheduled to complete in 2015. Once complete, the project will provide over 300,000 m2 of office space and become the country’s tallest building and the world’s tallest office building. 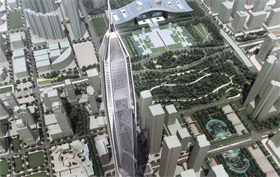 Also in China, the 632-meter (2,073 feet) mixed-use Shanghai Tower (see Figure 9) will complete a supertall cluster in the city’s Pudong area, as it sits alongside the Shanghai World Financial Center and the Jin Mao Building. 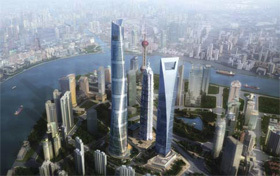 The Shanghai Tower’s unique dual-skin design provides atrium space containing “gardens in the sky” between the skins every 12 – 15 stories. The project began construction in 2009 and is scheduled to complete in 2014. Korea, a country with a population about 1/25th that of China but twice as dense by area, contains a somewhat surprising three of the 20 projects, two of which are located in Seoul. There are many reasons for this dramatic increase in supertall construction in Korea, a country that has never had a single building within the world’s tallest 20 and is now on the verge of having several. Perhaps the foremost reason is a general feeling that Korean cities lack the “iconic” or “landmark” buildings that many world-class cities contain. 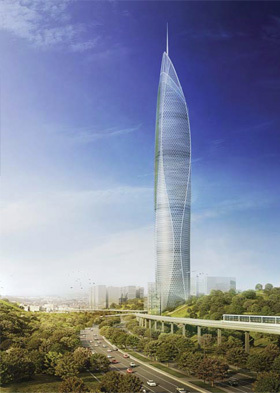 Seoul’s tallest planned building is the 640-meter (2,101 feet) Seoul Light DMC Tower (see Figure 10), located at the western edge of the city overlooking the Han River. The tower will implement power generation strategies to reduce the building’s energy usage by around 65%. Seoul is also home to the now-under-construction Lotte World Tower, a 555-meter (1,819 feet) supertall scheduled to complete in 2015. Besides these two significant buildings, the city has two additional projects in the works which have not yet received planning permission, and thus not included in the 2020 study (the 620-meter Triple One and the 540-meter Hyundai Global Business Center). This means that Seoul could potentially contain as many as four of the tallest 20 buildings in 2020. Where can we expect the next nucleus of tall building construction globally? The Signature Tower Jakarta (see Figure 11) perhaps predicts the answer to this question. 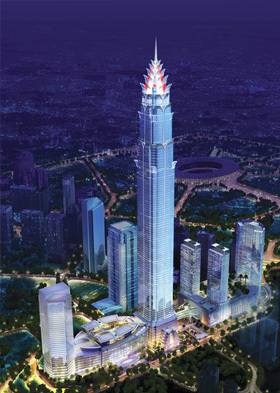 Indonesia’s current tallest building is Wisma 46, completed in 1996 at a height of 262 meters – less than half the height of the proposed Signature Tower. Much of South and Southeast Asia in fact, including Indonesia, India, and Vietnam seem ready to become one of the next centers of skyscraper construction. Together, the three countries listed above represent nearly a quarter of the world’s population and yet contain no supertall buildings and a total of only four buildings over 250 meters. Signature Tower is therefore seen to herald the coming of the supertall to these countries. Excavation for the project is set to begin during the first quarter of 2012. Another significant project in this area, Mumbai’s planned 700-meter India Tower, was not included in this study as construction has stopped, and final completion is therefore not predictable. However, the presence of these two possible megatall projects point to the dramatic potential of this area. Five of the Tallest 20 in 2020 projects are located in three countries in the Middle East: the United Arab Emirates, Saudi Arabia, and Qatar. 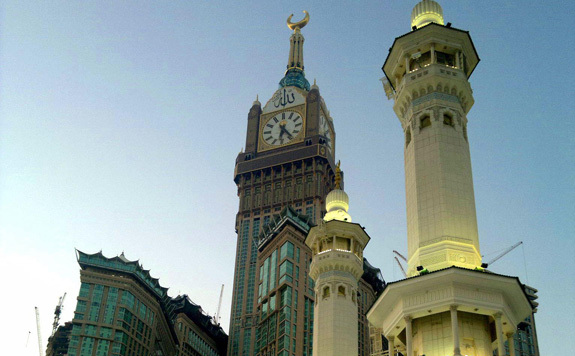 These projects include the current world’s tallest (Burj Khalifa), the future world’s tallest (Kingdom Tower), and what is soon to become the world’s second tallest (Makkah Royal Clock Tower Hotel, see Figure 12). Quite obviously, a motivating factor in all of these projects has been to push the boundaries of technology and accomplish feats never before imagined. The Burj Khalifa exemplifies this fact. The next decade of supertall building construction will, in one sense, fill in the gaps between the record-breaking Burj Khalifa and Taipei 101, the world’s tallest building until January 4, 2010. Thus, 15 of the Tallest 20 in 2020 fit into this 320-meter gap, with only the Kingdom Tower exceeding the height of the Burj Khalifa. Having discussed four regions/countries in the eastern hemisphere where 19 of the projects are located, we turn to the opposite side of the world for the remaining project. One World Trade Center Tower (see Figure 13), in New York, is set to become the tallest building in the western hemisphere in 2013. 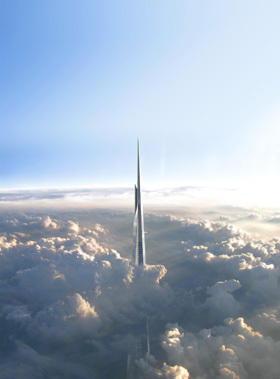 In the 2020 study, the project comes in as the world’s 12th tallest building. The building’s final height of 1,776 feet (541 meters) points to the United State’s declaration of independence, and birth as a country. Located near the site of the old WTC buildings, the designers faced tremendous challenges in terms of space constraints, security concerns, as well as millions of concerned citizens. In the case of One World Trade Center, there were strong economic motivations to build tall, to provide valued office space in one of the economic centers of the world, as well as strong emotional motivation, to overcome the tragic events of 9/11. The Tallest 20 in 2020 study ultimately underlines a now well-known fact: the skyscraper is here to stay. Shortly after 9/11, many predicted the death of the tall building, but as the study shows, skyscrapers are increasing in number, height, and diversity. The ever-increasing and rapidly urbanizing global population will continue to drive cities higher. Not long ago, building height was primarily restricted by structural limitations. In the late 1800s, Chicago’s Monadnock Building demonstrated the maximum height achievable with a masonry structure while still providing an economically feasible space efficiency. Over the 19th century, many advances in the fields of structure, construction, and transportation (to name but a few) allowed for a steady increase in building height. Now, the tremendous heights being achieved globally demonstrate that many of the physical constraints that once restricted height have been broken. The question for humanity is thus no longer “how high can we build?” but “how high should we build?” With every increase in height, there are energy implications in the construction, maintenance, and occupation of a building. Additionally, with added height comes less space efficiency, as structural members and service cores increase to service the increased height of the building. At what point are the significant benefits of increased density provided by building tall overtaken by the energy repercussions of height? This elusive figure is most certainly affected by the technologies of the day. Half a century ago, a megatall would have been considered possible only within a dream. It is now a reality. Is it not possible that we could soon see the emergence of a zero-energy megatall? Just as we pushed the structural boundaries of height, we must now continue to push the boundaries of environmental engineering in order to progress the tall typology. For, as skyscrapers continue to multiply, their effect on our cities – visually, urbanistically, and environmentally – continues to increase exponentially. 1. Buildings included in this study are either built, under construction or considered real proposals. Projects that have commenced construction, but with works currently halted, are also included if there is a strong possibility of the project progressing to final completion. A real proposal can be considered such if it has: a specific site with ownership interests within the building development team; a full professional design team progressing the design beyond the conceptual stage; formal planning consent/legal permission for construction (or is in the process of obtaining such permission); and a full intention to progress the building to construction and completion. Furthermore this research only considers projects that are within the public domain and have the consent for inclusion from the respective client-consultant teams.Because of this multi-faceted inclusion criteria, a number of prominent projects were not included in the study, including: India Tower, Mumbai; Triple One, Seoul; Hyundai Global Business Center, Seoul; and Zhongguo Zun, Beijing. 2. For the purpose of this study, Taipei has been considered a Chinese city. 3. Data as of December 2011. For full definitions of CTBUH building status criteria, click here.